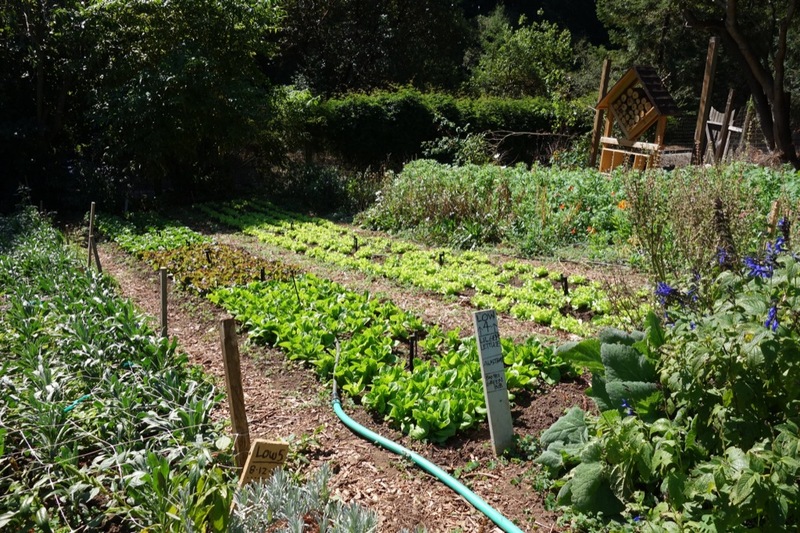 There’s a saying that you should learn something new everyday and while visiting Robby Franks’ Scotts Valley garden recently I added valuable lessons to my irrigation know-how and successful succulent and other low water-use plant cultivation. Slope with dry creek bed, succulents and other low water-use plants. You might remember a prior column of two about this “serial mole killer” as Robby laughingly described himself several years ago. He told me he’s licked his huge mole problem by exclusion and trapping plus he’s been the benefactor of a large gopher snake and a couple king snakes from the neighbors so he’s pretty confident now that his garden and all the work that goes into dividing and transplanting and mulching will not go in vain. The soil in Robby’s garden is quite sandy and thin. He’s done wonders adding his own compost over the years. We all know mulching is one of the best ways to conserve water in the landscape. Robby has long been an advocate of composting and regularly renews the mulch in his garden. He even calls himself “Mr Mulch”. He has permeable paths and a dry river bed that allow rainwater runoff to soak into the soil slowly. He keeps his plants pruned in a naturalistic manner because “smaller plants use less water'”. But all this wasn’t enough. His 3 “dumb timers”, as he calls them, were using too much water. That’s when he started researching weather based smart irrigation timers. “To me it seemed like an easy way to conserve water and it’s better for the plants as well”, Robby said. “It will increase the irrigation times if the weather is hotter and dryer than usual, decrease it if colder and turn itself off if it rains”. After research Robby eventually chose the Rainbird ”Simple to Set” Smart Indoor/Outdoor Irrigation timer. At a raised feeding platform a covey of quail were enjoying an afternoon snack. Below a group of Mexican marigold, fortnight lily, society garlic and euphorbia were thriving and Robby explained they are all watered with one irrigation hub called an Apollo 8 Port Bubbler. It is simple to install and screws onto an existing sprinkler riser or other 5/8” tubing. Each port can be adjusted to deliver just the right amount of water to each area. Attached a micro spray to the end of the 1/4” tubing and plants grow larger and deeper root systems. Robby’s garden is a diverse collection of plants from all over the world. He told me he’s been impressed how the cordyline are growing and considers them better performers than the popular New Zealand phormium in both heat and cold conditions. But succulents are his passion. He’s got five varieties of sedum, three types of aloe including his favorite ‘Red Tip’, two varieties of sempervivum although he laments they are slower growing then he’d like, echeveria and his new favorite plant, Dyckia ‘Red Devil’. Although technically not a succulent but in the genus bromeliad it does have similar characteristics. “They remind me of an underwater scene”, he said. Their dark, spiky foliage did look a bit like giant sea anemone. Robby does a lot a research and loves to share the knowledge he’s gained about plant cultivation and irrigation. 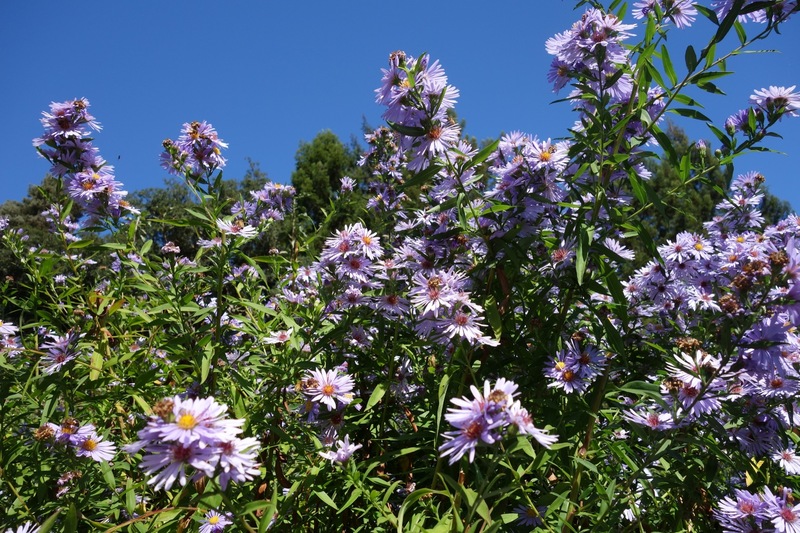 Many a garden in Scotts Valley have benefited from his passion. Robby Frank is on a crusade to save water and Smart Irrigation and mulching is one way to do it. 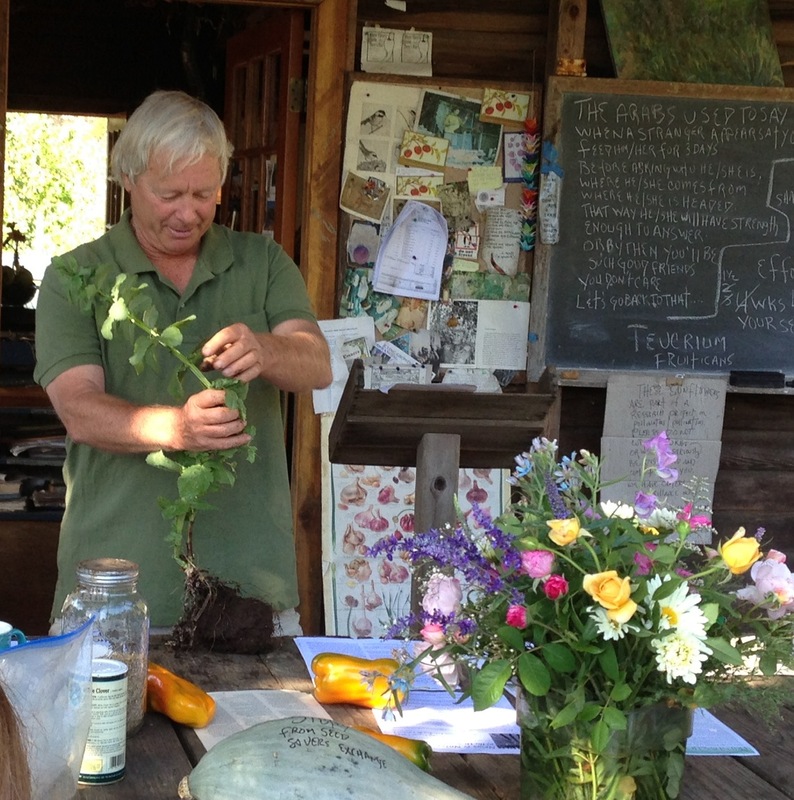 Orin Martin of the Alan Chadwick Garden on the UCSC campus is widely admired for his incredible knowledge and skills as a master orchardist, horticulturalist and teacher. I was lucky a couple of years ago when he visited a group of fellow designers and brought his favorite russet apples. Another time he brought a dozen different kinds of potatoes that we roasted, critiqued and thoroughly enjoyed. The Alan Chadwick Garden was nothing but poison oak and chaparral in 1967 when Alan Chadwick first got his hands on it. 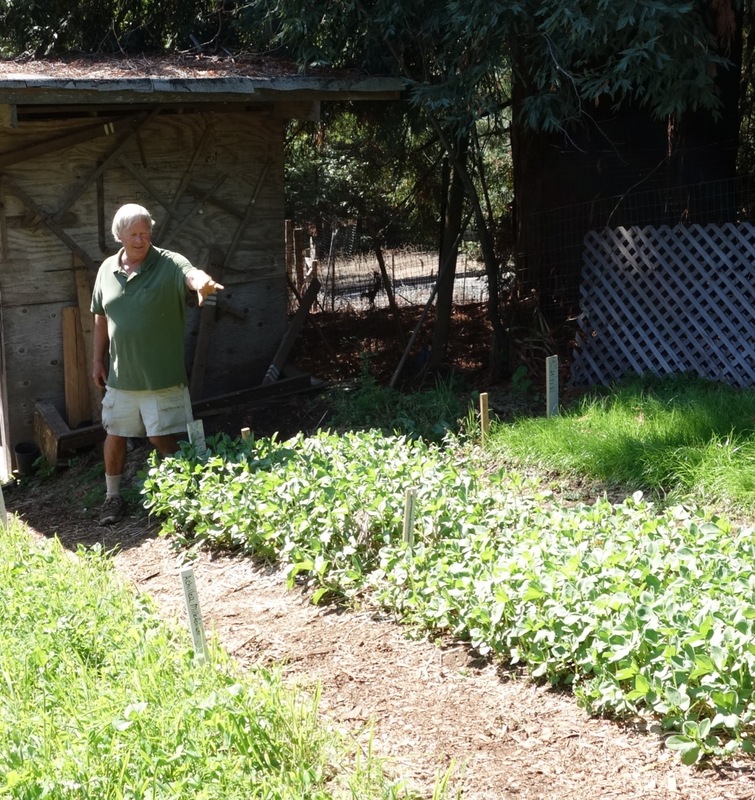 Martin came to UCSC in 1969 as a literature major but was soon impressed with Chadwick’s work, preaching the gospel of treating the garden as a self-nourishing system. Together they worked the garden, building the soil and teaching others. Now Martin runs the appre ntice program which teaches future organic gardeners and shares his knowledge in workshops like the Cover Crop class I recently attended. Last week I wrote about how and why to plant cover crops. This is what to do next spring after they’ve done their magic in the soil fixing nitrogen. Cover crops are plowed or skimmed off in late February to early April. Because it takes 3-5 weeks for the cover crop to break down so crops can be seeded or transplanted, it is often best to skim off the cover crop at the base of the plants and combine with straw or leaves to make compost. Previously made compost can then be applied to the surface. It is important to retain the roots and nitrogen-filled nodules in the soil. Take only the vegetative portion. Another method is to skim the foliage with a weed wacker or mower chopping it into small pieces 1/4″ to 4″ long. You can then rototill this into the soil and allow it to decompose on its own. In about 2 weeks the material should be broken down to be unrecognizable as plant material before replanting. If you are developing your soil to build organic matter and improve structure incorporate the cover crop at a more mature stage (half to full bloom) when it has a higher carbon content. The nutrients will be stored in the reservoir of humus and released slowly over a number of years. On established soils where you want primarily to fertilize next spring and summers crops, incorporate the cover crop after skimming and chopping when it has just started to flower as it decomposes quickly at this stage. The Chadwick Garden fertilizes its established fruit trees by simply cutting down the cover crop growing at their base with a machete at the 25% flowering stage. 4-6″ of wood chips are laid over the chopped up pieces and left for nature to decompose. That’s all their is to it. Martin explained that the garden used blood meal and the organic fertilizer, Sustane, during the first several years while the trees were becoming established. Picking up a clump of grass sown just 2 weeks ago, Martin teased off the soil to show the vigorous, fibrous root mass. “This is why the riches soils of the world, the Steppes of Russia and the original Midwest prairies, are so fertile and are called bread basket soils”, he explained. Plant a cover crop this fall and your soil will be richer for it. Every drop of rain that hits bare soil is destructive. Over 3000 years ago the Chinese knew how to protect their soil from erosion and increase fertility by planting cover crops. Early Nile Valley inhabitants 3500 years ago also practiced this method of agriculture as did first century Romans. Lupines were planted in poor soil when no animal manure was to be had. I learned this and also how to protect and improve my soil from Orin Martin, manager of the Alan Chadwick Garden at a cover crop workshop recently on the campus. “It’s all about the biology of the soil”, Martin said. “You grow the soil that helps you grow the plants”. A cover crop is really anything that covers the soil and protects it from rain, trapping nutrients and preventing them from leaching downward, he explained. Cover crops can increase the tilth of the soil. Quick germinating grasses easily loosen the top foot of soil with their root mass. Legumes have a tap root, a bio drill, that penetrates 30″ downward while alfalfa roots can grow even deeper. Cover crops like bell beans, vetch and fava beans are especially valuable as they increase nitrogen levels in the soil in two ways. Atmospheric nitrogen can be “fixed” and left in the soil to fertilize subsequent crops. This is in addition to the nitrogen left from the foliage of the legume. Cover crops are also called green manure when they are chopped up and turned into the soil in spring before going to seed. The planting of legumes like peas and beans can actually increase nutrients in your soil giving you a net gain which is needed to offset what you take out of the soil when you harvest fruits, vegetables and flowers. From late September to the end of November is the best time to sow cover crops. You will need to irrigate lightly a couple times per week if it doesn’t rain. You can also wait to sow just before the rains start. Be careful about working overly wet soil however as you can ruin the structure of your soil. The Chadwick Garden, Martin explained, originally was heavy red clay. 35 years of soil building with bell beans and vetch cover crops and compost have established a level of fertility that now supports several acres of vegetables, fruit trees, berries and beneficial flowering plants. Fall-sown, spring ploughed-down cover crops are the sole fertilizer used for the better part of the last decade. Martin explained that recent research now recommends planting a tandem of grasses and legumes. Annual cereal grasses such as oats, rye and barley germinated quickly to hold and shield the soil until the legumes take hold. Bell beans, fava beans and vetch which are the best legumes for our area grow slowly the first 3 months then take off growing 70-80% in the last 3 months. The ratio of grass seed to legumes can vary from 10% to 30%. There are other legumes that fix nitrogen but no where near as efficiently as bell beans. Crimson clover seed is also more expensive, needs lots of water to sprout and competes poorly with weeds. Mustard causes competition with the fruit trees as bees will concentrate on the mustard flowers instead of the fruit tree flowers. A question came up about using inoculants on legume seed. Martin explained that our soils have a native resident population of good bacteria that will break down the seed coat and encourage the plant roots to fix more nitrogen especially after cover cropping for a few years. We all followed Martin out to the cover crop trial plots to see how the different types were growing. Bark chips will soon be applied to the paths. All of the gardens are mulched several times per year with wood chips. A 10 year study, Martin explained, demonstrated the amazing benefits of ramial chipped wood which is the type the tree service companies provide for free. We watched him work the soil lightly with a metal bow rake then broadcast 8-10 seeds per square foot. Weeds were already cleared but Martin said this step doesn’t have to be perfect. Afterward the area was raked again lightly 1-2″ down and covered with 3-4″ of straw. Wood chips would be fine, too. Mulch heavier if you have bird competition. Cover crops are vigorous and will come up through just about anything, he said. Water in lightly. There are 3 ways to fertilize, Martin said. You can buy chemical fertilizer which is expensive and doesn’t do much for the soil. You can apply compost, which being carbon based, ramps up beneficial fungal organisms in the soil. 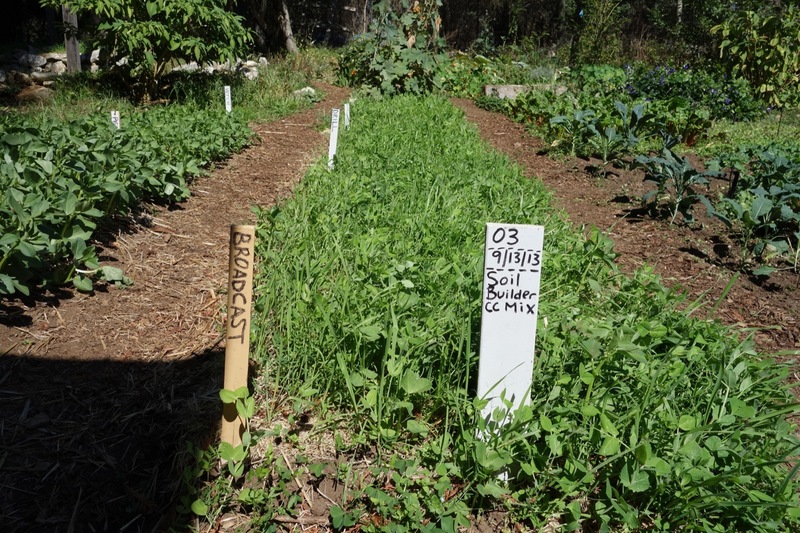 Or you can cover crop or grow green manure which increases beneficial soil bacteria. Orin Martin has proof of the benefits of the last two methods. Snails, Perennials,Compost & Caterpillars- Oh my! It’s no secret we live in paradise. No hurricanes or tornadoes wreak havoc in this beautiful place we call home. We’re spoiled and we know it. Enjoy every minute when you go into the garden. This month there are a few garden tasks you might consider doing while you’re out "smelling the roses". Slugs and snails turn into egg-laying machines in fall. That’s because they know they may not survive the long, cold winter and therefore, need to lay lots of eggs now that will hatch in spring. They want to ensure that there will be plenty of offspring to carry on the important work of devouring our plants. Snails build up populations faster than slugs because they reproduce more often but both are good at adding to the population. slug and snail baits containing iron sulfate. You’ll never get them all, but applying bait now should help reduce the number of slugs and snails that will hatch and make your life miserable next spring. If flowers on perennial p lants such as aster, campanula, calla lily, daisies, daylily, rudbeckia (black-eyed Susan) and yarrow were smaller than normal this year or your plants are just too big and crowded, it’s time to divide them. Dig out each clump so the rootball come up intact. This will take a little muscle but think of all those calories you’re burning in the process.. Gently shake off or wash off excess soil and divide with a sharp knife, pruning shears or a shovel I like to use an old serrated bread knife for this. Each division should have leaves and plenty of roots Replant each immediately. You’ll increase the number of your plants and save a lot of money, too. As summer flowers and vegetables give way to new plantings, add old, disease-free plants and debris to a compost pile or bin. Compost only pest-free weeds, fallen leaves and fruit. Also mix in kitchen vegetable and fruit scraps, coffee grounds and grass clipping. Chop up large pieces so they break down faster. Keep the pile moist like a wrung-out sponge. Depending on temperature , the size of the material in the pile and whether you use a barrel composter or an open pile, compost can take anywhere from 6 weeks to 6 months to mature. Diseased plant debris should be put in your compost can where the hight heat of a commercial compost operation will break it down. Cleaning up fallen, leaves, fruit and other debris will reduce the number of sites that harbor insects and diseases over the winter, too. #5 Enjoy Indian Summer. Winter will be here all too soon !